I am pleased to receive the endorsement from Judy Smith. Judy is a semi retired fund raising professional with two grown children and three grandchildren. She has served on her neighborhood association board for several years, and has lived in Charlotte since 1969, which some say is long enough to claim native status. I have had the pleasure of working with Judy on a rezoning issue that has been drawn out over a couple of years. Not every issue council members work on for constituents has an easy fix and it takes the dedication of neighborhood advocates like Judy to see these issues to completion. I am honored to have Judy's endorsement. Patsy Kinsey has been a strong advocate for our neighborhood as we have addressed a long, protracted rezoning petition that was filed 2 years ago and is still pending. She has been an accessible and strategic mentor sharing her deep insight and knowledge from five terms on city council. We appreciate her invaluable leadership and neighborhood advocacy. 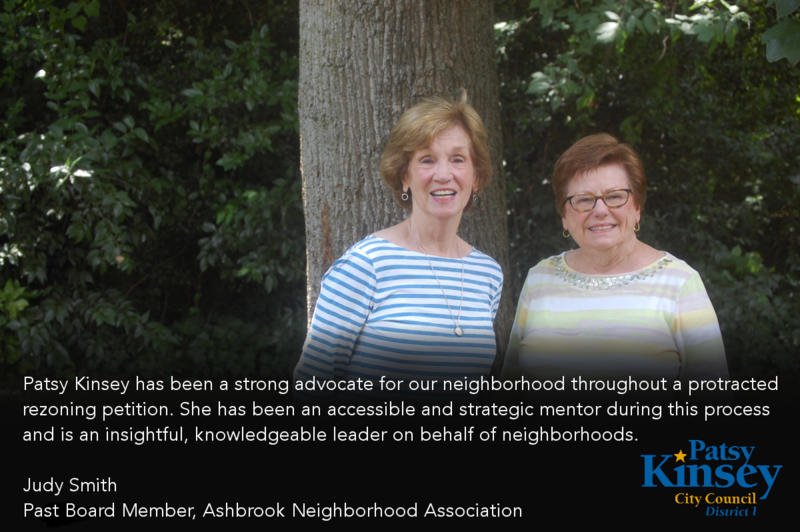 Patsy Kinsey is an accessible advocate and an insightful, knowledgeable, strategic leader on behalf of neighborhoods.